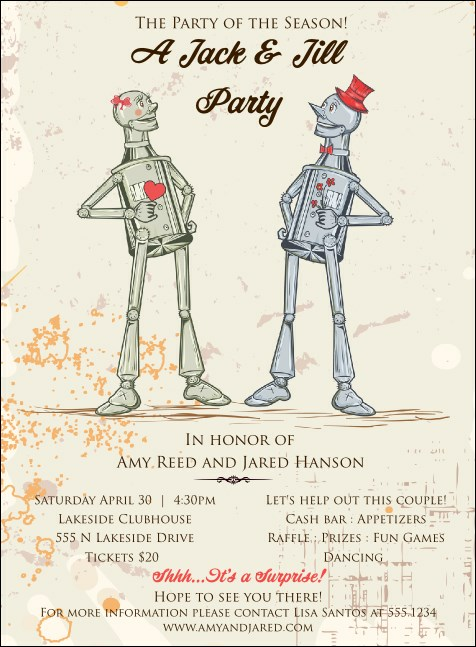 Send a warm, fun welcome to your event with the Robot Jack & Jill Invitation. An adorable couple of robots makes eyes at each other, while event details conveyed in timeless typeface gather round. Customize to your needs in minutes—we’ll print and ship! If you’d like matching envelopes, no problem! They’re available to add to your order. Dimensions measure approx. 4.14" x 5.63"
Get the word out to everyone on your guest list! Shop customizable invitation templates on TicketPrinting.com.